When President Barack Obama started bombing Syria in 2014, he enjoyed bipartisan support in Washington, D.C. Americans were appalled by the atrocities of the Islamic State, which had massacred Yazidis, and seized swaths of territory in Syria and Iraq. And sure enough, with the Islamic State on the ropes, the Trump Administration has announced that some 2,000 U.S. troops will stay permanently in the Kurdish region of northern Syria. Ostensibly, the troops will fight Islamic State remnants and combat Iranian influence. In reality, the United States seeks to remove President Bashar al Assad, or failing that, dismember Syria into zones controlled by outside powers. In 2014 the U.S. responded to Islamic State attacks on Yazidis by bombing northern Syria, and later sending troops there. Here aid workers provide food for Yazidis after the attacks. On February 7, U.S. jets and artillery attacked pro-Assad forces in Khusham, an oil-rich area in north eastern Syria outside of the Kurdish region. The U.S.-allied Syrian Democratic Forces (SDF) had captured the area from the Islamic State and Assad-allied troops were trying to take it. Needless to say, the fighting had nothing to do with Yazidis or remnants of the Islamic State. Then on February 9, Israel claimed an Iranian drone entered its airspace, a charge denied by Iran. On the same day Assad’s artillery shot down an Israeli jet fighter, the first such loss since 1982. In retaliation Israel bombed a dozen sites in Syria. The United States is allied with Israel against Assad, Russia, and Iran. How did the United States get tangled up in another Mideast quagmire? In September 2014, the United States had no allies on the ground when it began bombing the Islamic State in Syria. The CIA and Pentagon had spent more than a billion dollars trying to create pro-U.S. rebel groups that would fight Assad. Both agencies failed miserably as the ostensible guerrillas accepted U.S. arms and promptly handed them over to terrorist groups fighting in Syria. But there was one insurgent group, the Kurdish-based Democratic Union Party, that effectively battled the Islamic State. The problem, from the United States’ perspective, was that the group was affiliated with a leftist Kurdish group based in Turkey. Turkish leaders denounce the group as terrorists—an accusation that conveniently covers up Turkish government repression of its Kurdish minority. Turkey invaded northern Syria in 2016 and seized part of the Kurdish region in order to prevent the SDF from creating a contiguous territory along the Turkish border. Turkey, like every foreign power invading Syria, proclaimed their incursions as temporary. But it set up military bases and ran electricity wires from Turkey into the Syrian cities under its control. Then, on January 20 of this year, Turkey launched an invasion of Afrin, an isolated area in the far northwest of Rojava, the Kurdish name for their region in Syria. Turkish bombing of the city has already killed 150 civilians and wounded 300, according to Sinam Mohamad, the representative of the Syrian Democratic Council in the United States. The council is the political wing of the SDF. Mohamad says that the ultimate goal of Turkey is to drive the Kurds out of Afrin in order to create a buffer zone under its permanent control. She accuses the Turkish Army of ethnic cleansing. “They want to kick out the Kurds,” she says. The Turkish military created a Syrian Arab militia, appropriating the name Free Syrian Army. The group stands accused of war crimes for mutilating the body of a Kurdish female fighter, and filming it. Mohamad compares such actions to atrocities carried out by terrorist groups. “What’s the difference between them and Islamic State?” she asks. But the United States has no plans to prevent the Turks from taking Afrin, putting the lives of hundreds of thousands of civilians in peril. The Pentagon seems to be drawing a line at the Rojava town of Manbij, some thirty-seven miles east of Afrin. The United States sent high ranking army officers into Manbij, riding in vehicles prominently displaying U.S. flags, accompanied by a New York Times reporter to make sure the message was received in Ankara. 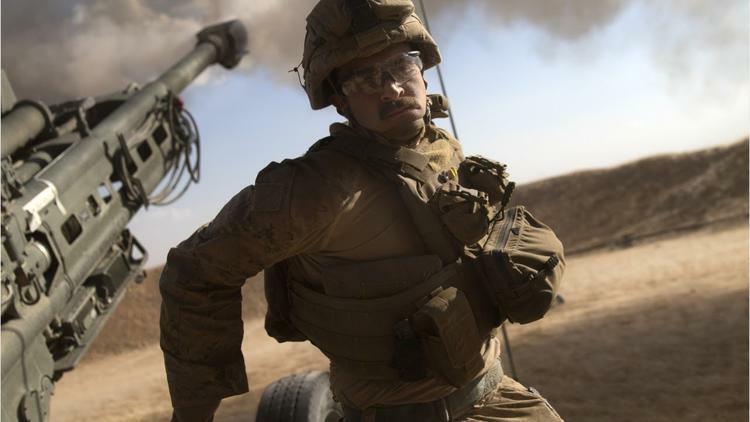 For the moment, it appears the U.S. military will maintain its alliance with Kurdish forces while Turkey will continue its military opposition, but within limits. In my opinion, the Syrian Kurds are playing a very dangerous game allying with the United States. They may think it will protect the Kurds, but nothing in history suggests it will be a reliable partner. And the people of Rojava will suffer. Reese Erlich’s syndicated “Foreign Correspondent” column appears every two weeks. The revised and updated edition of his book The Iran Agenda: The Real Story of U.S. Policy and the Middle East Crisis will be published in September. Follow him on Twitter.